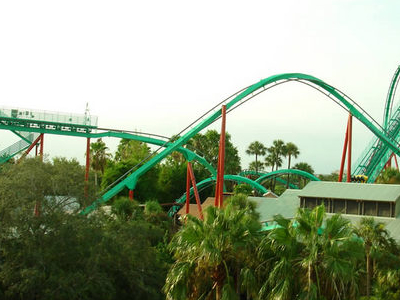 Kumba is a Bolliger & Mabillard sit down roller coaster located at Busch Gardens Tampa Bay, in Tampa, Florida. Built in 1993, it stands 143 feet (44 m) tall and has a top speed of 60 mph. 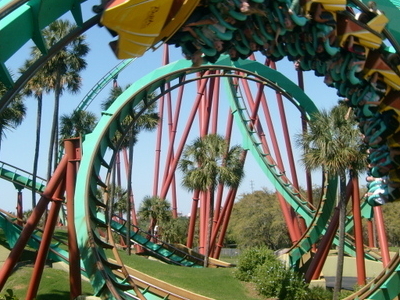 Kumba is one of the first in a line of multi-inversion coasters (that is, those having six or more inversions) built by B&M, and featured B&M's first ever diving loop and interlocking corkscrews. The ride starts when the trains make a right-hand, 90-degree turn out of the station. Then, the riders climb the 143-foot-tall (44 m) lift hill. At the top, the 32 passenger trains pass through Bolliger & Mabillard's signature pre-drop element before making a swooping 135-foot (41 m) drop to the left, leading right into a 114-foot-tall (35 m) vertical loop, which wraps around the lift hill. After leaving the vertical loop, riders rise up into Bolliger & Mabillard's first ever Diving loop. Following this, trains rise up into a Zero-G roll, before dropping to the ground. After speeding along a short straight section of track and small hill, trains pass through a Cobra roll, flipping riders upside down twice. A footbridge crosses over the entrance and exit to the Cobra roll. Leaving the cobra roll, the trains rise up into the midcourse brake run. Kumba was delivered with four trains, but in regular operation, can only run three. A fourth train is always in storage, and used to allow three train operation when another train is taken out of service, allowing one as a spare. Kumba is one of two Bolliger & Mabillard roller coasters to feature a vertical loop that wraps around the lift hill. 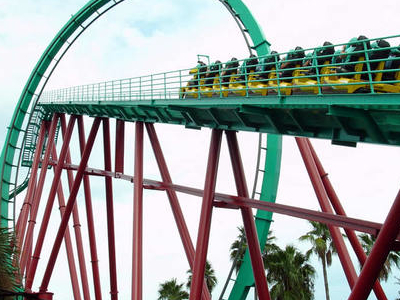 The other roller coaster with such a vertical loop is Riddler's Revenge, a Stand-up roller coaster at Six Flags Magic Mountain. This was the first ride to feature a number of now-common Bolliger & Mabillard roller coaster elements, including interlocking corkscrews and a diving loop. Riders must be 54 inches (1.4 m) tall to ride Kumba. The tracks were repainted in 2011. Here's the our members favorite photos of "Roller Coaster in Tampa". Upload your photo of Kumba Roller Coaster!